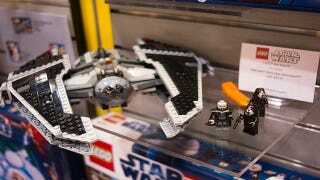 We saw a lot of Lego sets at the New York Toy Fair on Sunday. Sadly, Minecraft Legos did not make an appearance, but we did get to play around with figures from Star Wars: The Old Republic, The Lord of the Rings, and a whole bunch of superhero franchises. Two Lego sets based on The Old Republic will be available for sale this August. There's the Sith Fury-Class Interceptor (above), retailing for $90. And there's the Striker-class Starfighter (second pic above), retailing for $45. These may seem a bit pricey, but hey, at least they don't charge monthly.